Okay so no joke I first got Mako: Island of Secrets which is the spin off to H20: Just add Water. What are the odds? But when I went to watch it I couldn’t find it on Netflix streaming. There is however the Netflix original show Mako Mermaids which is not the same thing. As I didn’t not foresee the Movie/Tv show that I randomly get not being available I suppose I should make addendum to the rules in which I will re-spin if the assign movie/show is not available for streaming. I mean I would have watched it but it’s not there for me to watch and since I purposefully didn’t add Hulu to the mix I won’t watch things on there for this purpose. Nor can I really get the physical copy of the movie/show So re-spining….. The story is told as flashback on the formation of The Dragon Racing. Basically we have a basic tradition vs modernity story. Regattas are boring and old fashion and Dragon racing is cool and hip. My issue that takes me right on out is the use of the word Regatta which is Italian in origin and comes out the 17th century. This story is set with vikings, or roughly 760 to 1060. So ergo Regatta CAN NOT BE OLD FASHION to to their own world building. Oddly though if you look up viking boat race on google you get a to the howtotrainyourdragon wiki for the Regatta. Then again they are using Scottish accent for Norwegians so I don’t think there is much attention to internal consistency. Somehow the word Regatta gets annoys me more than the name of the characters or the place of Berk. Then again this is fantasy so I shouldn’t be so nitpicky about a word choice. I’ll admit that. My point is they could have picked a better word then Regatta, their target audience wouldn’t have know the word so who cares? Also Stoic is totally cool with forgoing the boat race for Dragon racing so whatever. Let’s turn something inclusive that most of the people can watch to something exclusive that no one can really watch. At least Toothless is still cute! I feel like this whole thing is How to Train your Dragon: Quidditch Style. It’s not even a race it’s getting sheep for a points. It’s more like flying polo. Also where did the snow area come from? During the race there was a snowy area. Where was that ? Up a mountains? Another planet? A Fjord? Answer me! Because nothing else was snowy. While I do like the other How Train your Dragon movies this was not good and more confused then entrained. 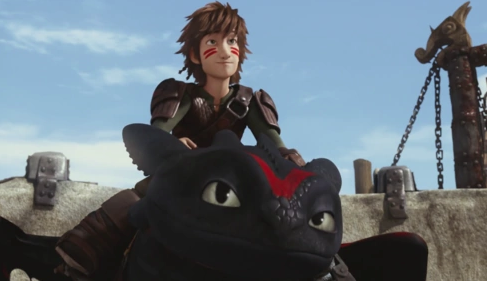 At least Toothless was cute!!!!!! I remember my cousin had a HOND comic, I can’t recall it now and I read some pages, I loved the illustrations, I love comics, but I never read it ’till the end and he doesn’t have it anymore. Any chance you know a Hunchback of Notre Dame comic? I once found one, but it wasn’t the same he had, the one I found had a blonde Esmeralda, which I didn’t like. His was quite faithful to the book, at least to the extent I read of the comic.